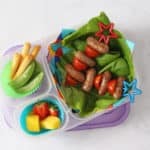 These Sausage & Cherry Tomato Skewers make a fun lunch idea for kids, perfect to pop into lunch boxes for school or work! Cut the chipolatas into 3 small sausages each, so 6 in total. Bake in the oven for 15 minutes until browned and cooked through. Meanwhile cut the cherry tomatoes in half and once the sausages are cooked and are cool enough to handle, place them onto two plastic skewers. Add the skewers to a lunchbox, along with the rest of the ingredients.